Today is Perfect Picture Book Friday where I link up with Susanna Leonard Hill’s fantastic group of picture book writers, illustrators, librarians and others. As usual, I have a couple of things to share before I get to the picture book review.I want to invite you to visit two of the best kidlit websites in cyberspace – Katie Davis and KidLit411. The other day, it was my pleasure to do a podcast with Katie Davis and her wildly popular Brain Burps. We talked about the importance of marketing yourself as an author and how to get the word out about your books. She’s offering some amazing FREE training that you can find out about by listening to the podcast. Of course, good promotion is critical for any product or service you offer, so Katie’s words of wisdom will apply to many people, not just authors. Click here to go to the podcast. One of the ways you can expand your exposure, is by doing guest posts. And it’s also just so much fun to connect with other bloggers. I was honored when Elaine Kiely Kearns invited me to join KidLit411 for an interview. Please stop over there also – you might find out some new tidbits about me and the why and how of my writing journey. Click here to go to the interview. And now…hurray…it’s time for our Perfect Picture Book review. These days, single parent families are pretty common. But the Andy Griffith Show, starring Andy Griffith as single dad Sheriff Andy Taylor and Ron Howard as his son, Opie, was a ground-breaking concept for television in the late 1950’s and early 1960’s. I know this was ‘only’ a TV series…but I believe it gave a powerful message for all parents today…set the rules with love, enforce them with compassion and remember to be the parent! Please don’t forget – we are celebrating National Library Week, so if you sign up for my newsletter, not only do you get the one sheet Anti-Bullying Tool Kit for Kids, but your favorite local library might be the lucky winner of one of the five copies of Show Me How that I am giving away. Just click on this link to subscribe. 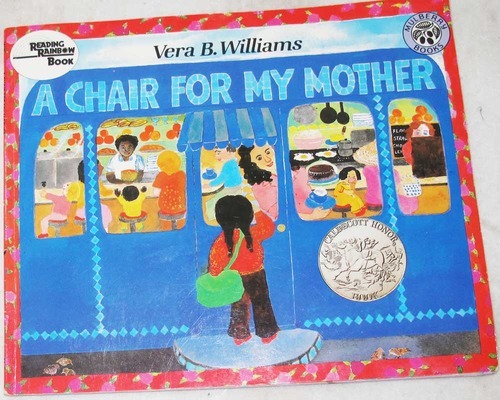 This entry was posted in Katie Davis Brain Burps, KidLit4411, Marketing as an Author, National Library Week, Perfect Picture Book Friday and tagged A Chair for My Mother, Andy Griffith Show, Book Giveaway, Make a diorama with kids by viviankirkfield. Bookmark the permalink. This looks like a good one. I hope the library still has it on the shelf. Hope to make it to the other places you are digitally hanging out! Always in search of books about different families. This one sounds excellent. 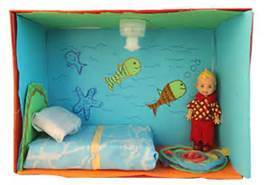 I loved making dioramas when I was young — usually they were for book reports. Completely forgot about that memory. Thanks! This is one of my favorite books. Always used it as a read aloud discussion with kindergarten students. Ah, Vera Williams – yum, yum, yum! This one sounds VERY familiar – I’ll bet I’ve read it at some point – and I LOVED making dioramas. Great memories both ways. Thanks, Vivian! I love how they save up all their money for something special. Sounds like a wonderful story and dioramas are a lot of fun to make. Thanks for all the links to the different resources. This DOES sound like a special book and I can’t wait to read it. I”ll check pronto pronto to see if I can get it at my library. Beautiful sweet book. Loved making dioramas as a kid. Great interview on Katie Davis podcast. Had to laugh at your comment about staying up late, which is something I do – A LOT! True it is often the only way to connect sometimes with others around the world. Loved it! Just reading the synopsis of this book makes me cry! So sweet! Thanks for sharing this at Booknificent Thursday! getting that kind of information wriitten in such a perfect approach? look out for suc info.